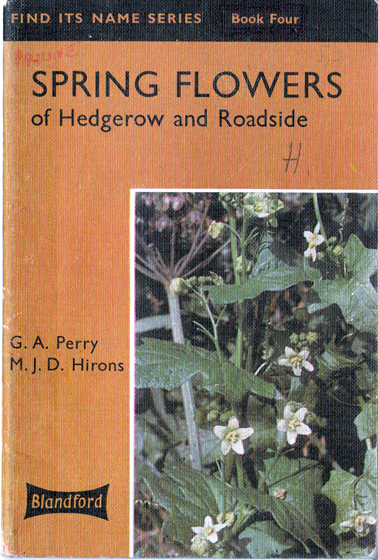 Description: "This [book] aims to present a quick means of identifying [flowers]. Each [flower] is represented by a full-page colour photograph, accompanied by a page of simple descriptive text with line drawings of any important detail—say a leaf or petal. A further aid to recognition of species with large leaves is the ingenious life-size reproduction of a leaf in the form of a pale tinted outline, underprinted with the text. When the specimen has been identified, the reader is invited to answer certain simple questions from further observation and to attempt a section on 'more things to do and find out'. The emphasis throughout is on learning by discovery." 'Textured' pictorial soft covers have some markings and inscriptions on the front (refer to image), but are in good overall condition. Some blue ink has been spilled onto the extreme tips of pp. 8-19, and has therefore not affected the pages themselves. Remarkably, none of the missing words have been filled in, and what marks there are have been made in pencil. Equally remarkable for a former classroom book, is how well-preserved the pages are: bright, completely free from tanning, and with only the odd jot of foxing. Corners have been thumbed, but the leaves are largely crease-free. Measures 18.5 cm × 12 cm (7.4″ × 4.8″). 12mo. 39 pp.